WAIPAHU — Ty Yukumoto threw a two-hitter and went the distance in a mere 65 pitches to lead Leilehua to a 5-0 win over No. 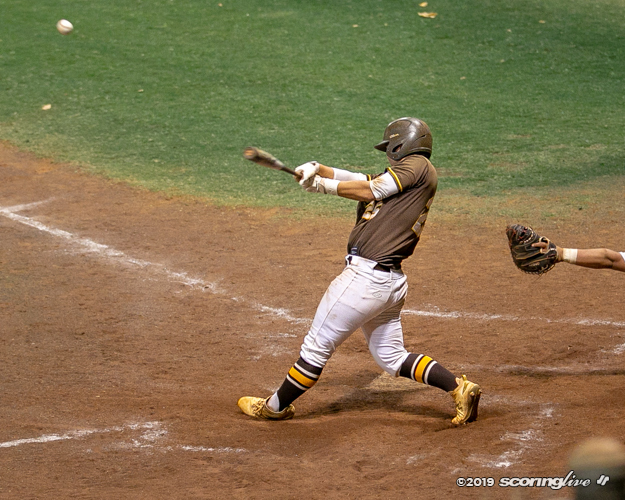 10 Mililani in Oahu Interscholastic Association Division I baseball Wednesday. 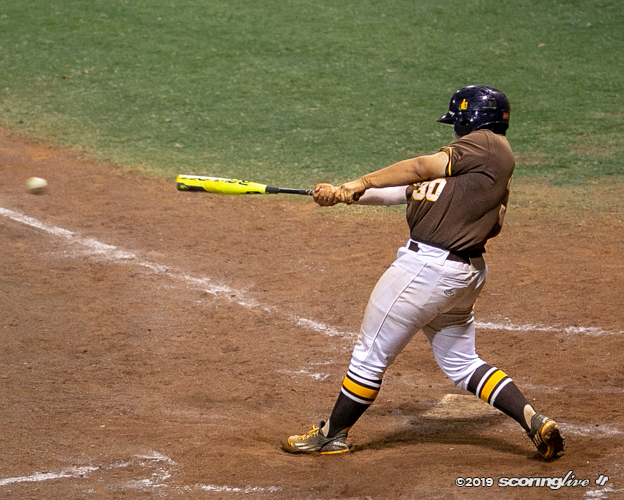 The Mules (6-4) backed the right-handed sophomore hurler with 10 base hits, including three apiece by Hunter Sasaki and Lii Wofford, in front of a crowd of an evening crowd of about 200 spectators at Hans L'Orange Park. With the win — their second shut out in five days — they jumped into second place in the D1 West standings with two games remaining in the 12-game regular season. The Trojans (8-2), who scored a combined 40 runs in their last two games, were shut out for the first time and saw their four-game win streak snapped. 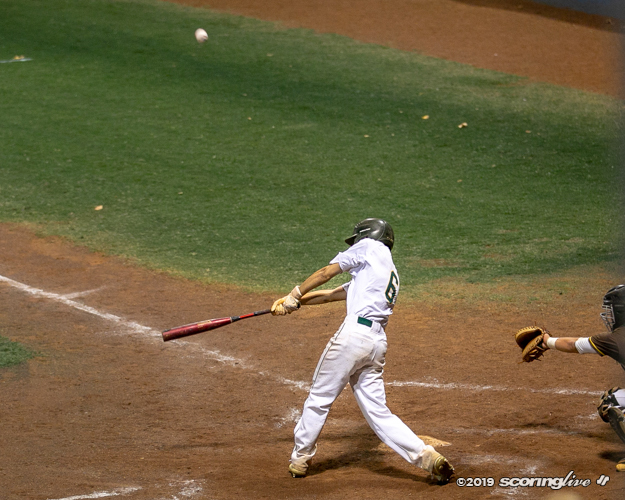 The loss, combined with Campbell's 4-1 victory over Aiea earlier Wednesday afternoon, dropped them a half-game behind the Sabers and into second place. 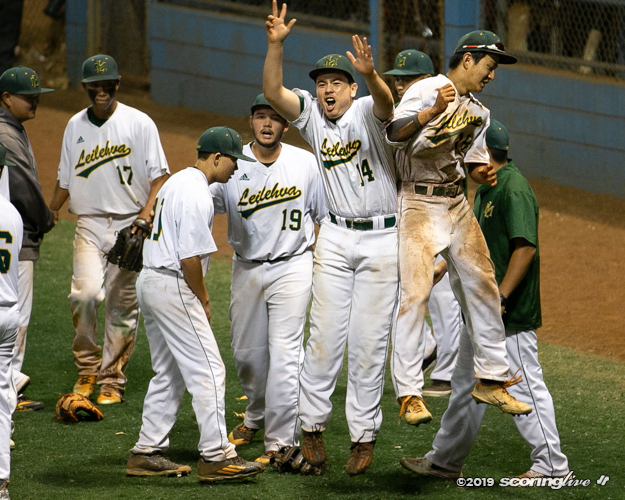 "It was a great outing for Ty, as well as the whole team; It was a team effort," Leilehua first-year coach Mark Rios said. "They came to get it right and wow, just everything fell in line for us today." Everything certainly fell in line for Yukumoto, who was in complete command on the mound. He struck out five batters, including the first two he faced, and allowed just four Trojans to reach base. He hit one batter and another reached on an error. Of the other 16 outs, he got an even eight groundouts and eight flyouts. "I just had so much adrenaline out there and I was just having fun," said Yukumoto, who recorded four six-pitch innings. "My command was pretty good today. I was just trying to hit my spots and they just put the ball in play and my defense helped me." 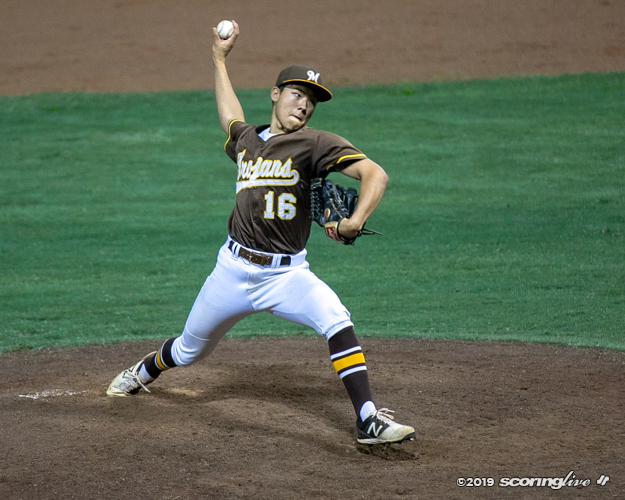 The 5-foot-5 Yukumoto threw a staggering 50 pitches for strikes (76.9 strike percentage) and issued first-pitch strikes to 18 of the 25 batters he faced. It was his second complete game this season, but the first time in five starts that he did not issue a walk. In fact, Yukumoto did not reach a single three-ball count all game. "Ty did a great job. 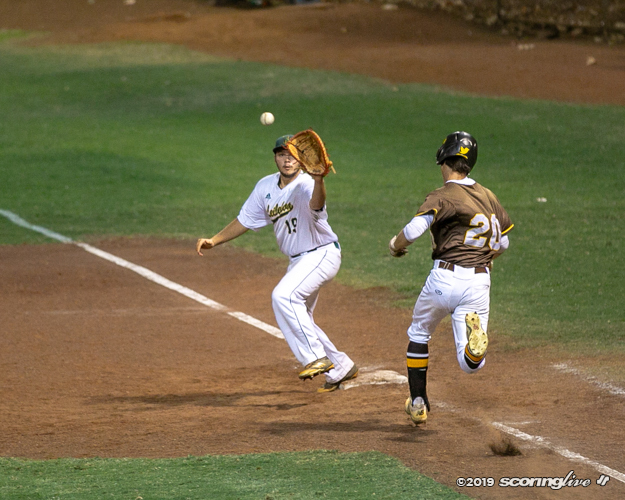 We couldn't ask for anything better," said senior shortstop Shyden "Kaika" Cordero, who drove in the Mules' first two runs Wednesday. 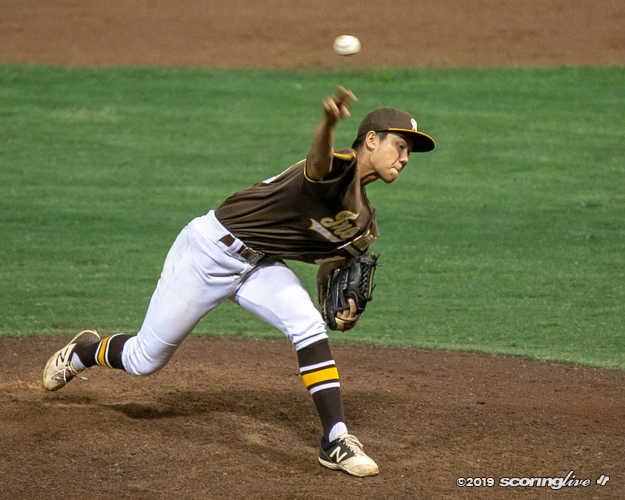 Three weeks ago Yukumoto fired a one-hit shut out in a 64-pitch outing against Kapolei. He was also the winning pitcher in Saturday's 10-0 five-inning win over Pearl City with four innings of shutout ball. He is now 4-1 on the year with a 1.11 ERA — the seventh-best mark amongst D1 pitchers with at least 10 innings pitched. "If you look at the stats going back in to the last few times he pitched, he's there," Rios said. "He's been around the plate, his pitch count has been low and you know, we were gonna limit him to 65 to 70 (pitches), but he was just so pumped and on today we just decided to ride him out and let him go." Rios said he notified Yukumoto of the planned pitch count at Tuesday's practice, but the latter said it had no effect on his approach to the start. "I just went and wanted to try and help my team as best as I can and if I go beyond (the pitch count), then I know the next guy up will produce," Yukumoto said. 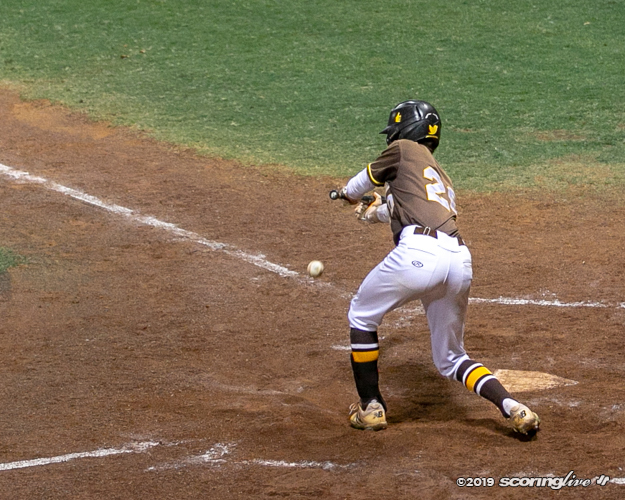 About the only trouble Yukumoto got into came in the bottom of the third, when the Trojans loaded the bases with one out after singles by Jayton Pang and Micah Kaohu, and JR Suehisa reached on an error. 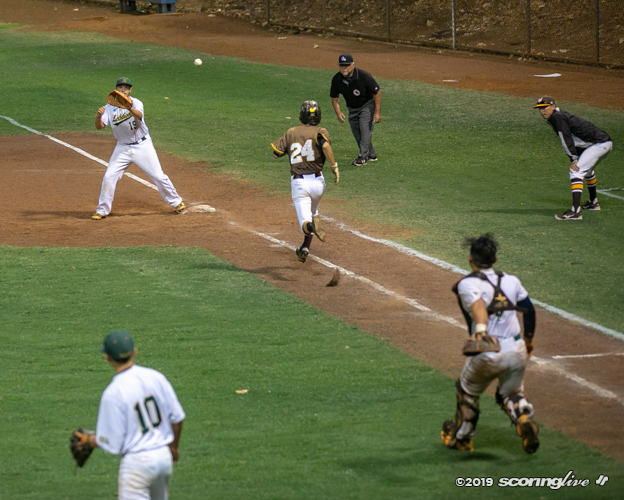 However, Yukumoto struck out Jacob Hirayama on four pitches for the second out and then got Ethan Thomas — who collected five hits and eight RBIs in two games last week — to line out to Mason Yamashiro in right field to get out of the jam. 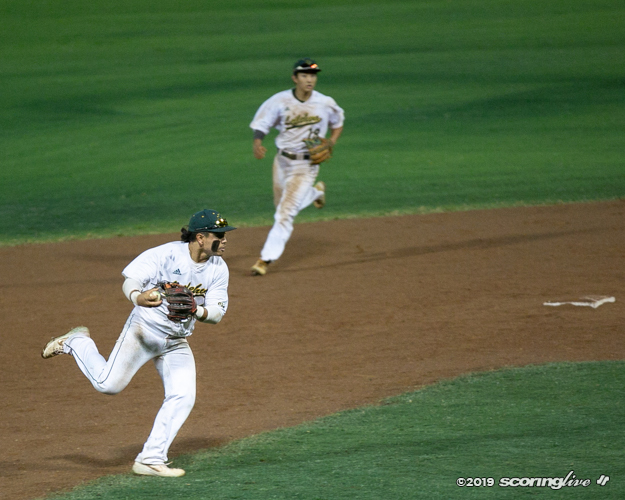 "Any time you can get out a player of Hirayama's stature, that's clutch and then with Thomas we know he's been hot, so there's a threat there, but luckily (catcher) Jaxon (Hotta) and Ty had a good, good plan going into him — I think they were feeding him low and away — and we got the out," Rios said. "I think the man upstairs was looking out for us today and the boys just came to play." 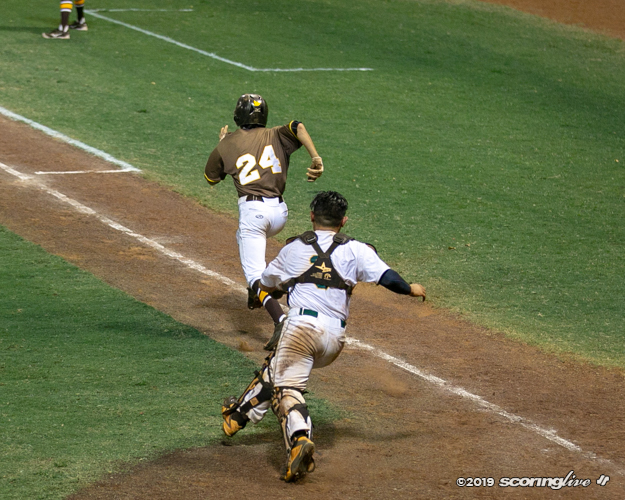 The Mules gave Yukumoto an early cushion with single runs in the first and third innings. Cordero drove in leadoff batter Hunter Sasaki in each of his first two at-bats. His RBI-ground out in the top of the first plated Sasaki, who singled to right field to lead off the game and moved into scoring position on a Yukumoto single. In the third inning, Cordero clutched up for a two-out double down the line in left to bring Sasaki in from second. "I just saw it go for the fence," said Cordero, who added that it was an inside fastball that he turned on. The score held until the top of the seventh, when the Mules sent nine batters to the plate and added three insurance runs. 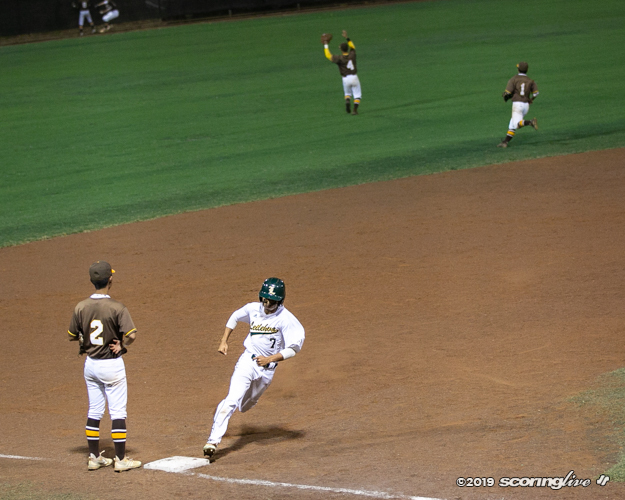 Sasaki plated Masen Reis with a double to the gap in left center and came around to score himself on Lii Wofford's two-out bloop-single to short right field. Cordero, who was intentionally walked in the inning, closed out the scoring after he crossed the plate on a Jason Shiigi wild pitch. 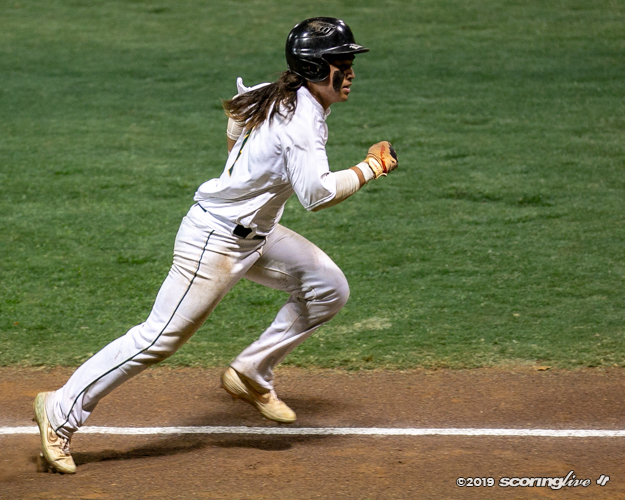 Sasaki, a sophomore second baseman, recorded his second straight game with three stolen bases and Wofford, a senior third baseman, extended his hitting streak to four games in the win. 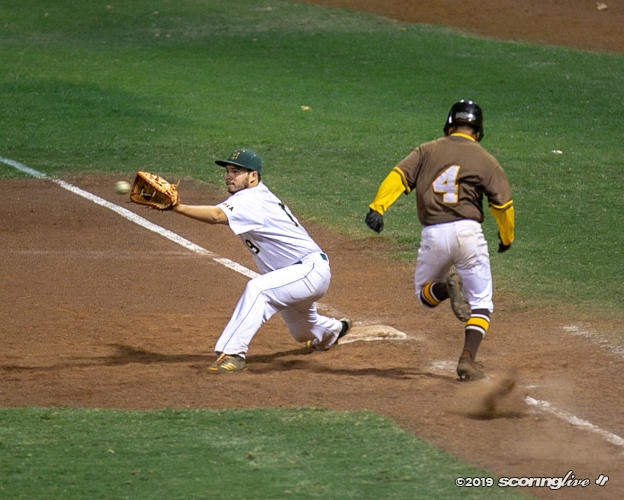 Cordero, one of 10 seniors on the Mules' roster, made his first start at shortstop after shoulder issues relegated him to designated hitting duties for the first nine games of the season. "That kid is a battler. His hitting skills are just unbelievable," Rios said of Cordero. "He's working through an injury and getting back 100 percent today — he's been DH-ing the past couple games — but his bat, he's probably the most consistent batter that we've got. I love that kid and the way he works. He's just unbelievable. He's an unbelievable talent." Cordero made several dazzling defensive plays at shortstop, but none more spectacular than his bare-handed pick-up and throw to first on a Hunter Faildo groundout to lead off the bottom of the seventh inning. "He did beautiful today. Even with that barehand play, I was looking at him and I was like, ‘damn!' It was perfect," Yukumoto said. 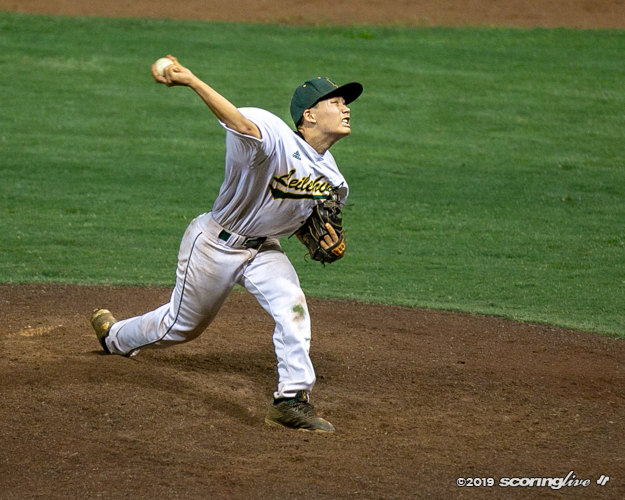 Shiigi walked four and struck out two in four innings of relief of starting pitcher Tanner Moran, who gave up six hits in three innings to fall to 2-1 on the season. It was the second time the teams played this season. 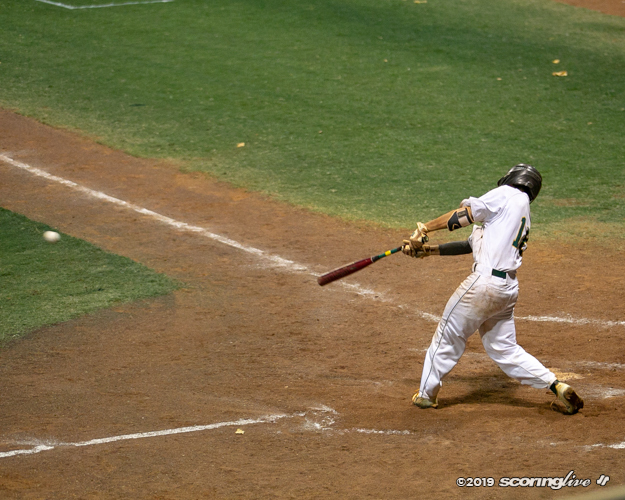 Leilehua committed five errors in a 9-2 loss to the Trojans in mid-March. "Our first game against them we kind of gave up a little because our mindsets weren't there, but (this time) since we're playing on TV and all the boys on my team, they have the adrenaline building up and they just played how they're supposed to," Cordero said. "A win like this is great because it shows how much fight we have and over time we really worked hard together and we bonded more and it just showed out today and as you saw on the field, we did great." Rios agreed with Cordero's assessment on the momentum-building win. "You know, momentum is big. 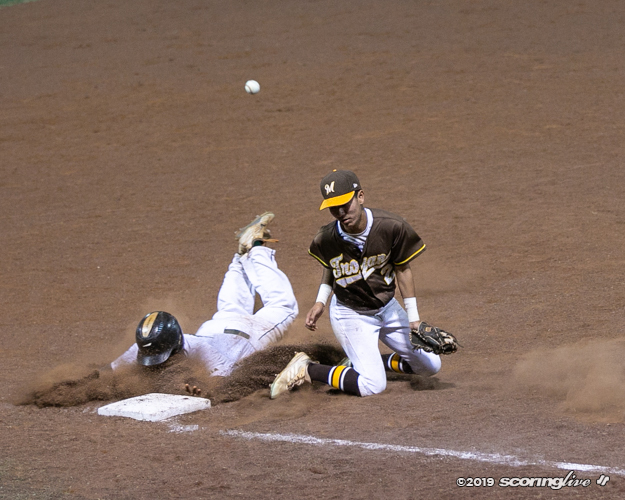 If you can peak at the right time going into OIA playoffs and states, that's really important and Mililani is a great team and like I said, I think the boys earned everything together," Rios said. The Mules close out the regular season against Kapolei Monday before visiting Waianae next Wednesday, the same day that Mililani will host first-place Campbell. The Trojans finish the regular season at Pearl City on Apr. 20. Iolani claimed its first league title since 2003 with third straight win over Punahou. 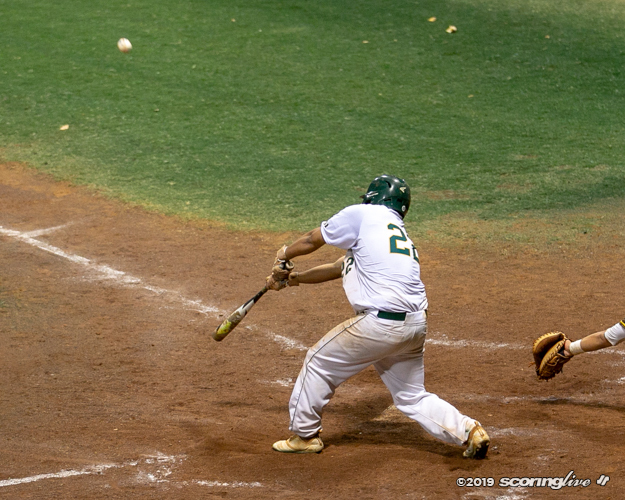 Buffanblu win their first ILH title in 14 years in a game that had nine total home runs. 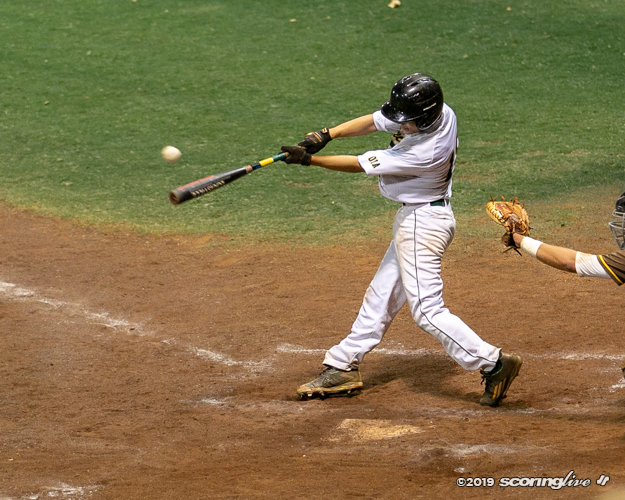 The Kamehameha junior RHP and Campbell senior CF clutched up in postseason wins last week. The Mustangs won their 11th straight match to reach the OIA Division I championship. Na Menehune swept the Mules, 25-18, 25-21, 25-15, Monday night at Radford's gym. Crusaders gave up five runs in the top of the third, but kept fighting for a key win.